I love to window shop, or faire lécher les vitrines, as they say in French, literally meaning, to lick the shop windows. Saint Germain is such a posh and vibrant neighbourhood that there are a plethora of trendy shop and gallery windows to lick. It’s filled with fabulous, high-end interior design shops, luxury fashion boutiques such as Giorgio Armani and Louis Vuitton, but for this particular blog post I have decided to focus on 5 of the more quirky, but no-less worth visiting, finds in the neighbourhood. Just a couple of blocks south of the River Seine on a little side street you will find Olivia Tourlier’s tiny clothing boutique. The clothes and accessories are casual-chic with a little rock and roll edge. If you’re looking for a souvenir T-shirt, but want something with a little more class than a white, made in China, “I heart Paris” tee, or if you want some classy, souvenir accessories then this is the place. Tourlier designs all the motifs herself. She has found a wonderful balance in her designs that are evocative of Paris, blending elegance and a bit of edginess at the same time. There is always a mix of tourists and locals alike in this place. If you want to get your hands on some nice French cosmetics and skin care products at a discount price, then this is the place for you. There is a wide mix of brands to choose from. It’s also a good spot for picking up grooming essentials like toothbrushes and deodorants as well as over the counter medications like aspirin or antihistamines if you are in need. I have never seen Citypharma not busy. There is lots of staff on hand but they are helping a large volume of customers so sometimes you may have to wait just a few minutes if you have a question. 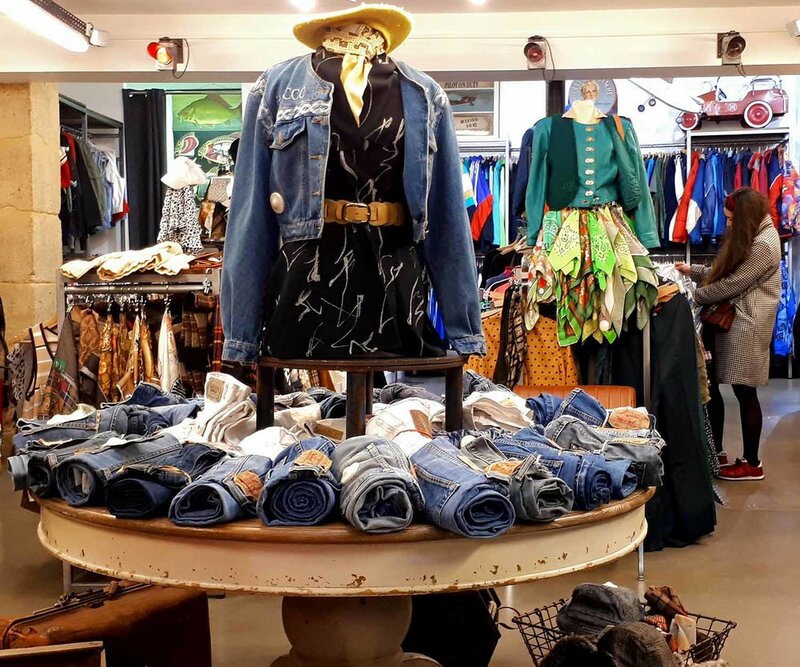 Hippy Market is a paradise for those who love vintage and have a unique fashion sense. It looks pretty insignificant from the street but once your inside it opens up to a sea of great vintage clothing and accessories. There is a huge selection. The merchandise is creatively displayed and in excellent condition. There are 2 additional locations in Paris, aside from the one in Saint Germain. Doesn’t everyone need a souvenir Emanuel Macron snow dome or a flamingo toilet plunger to remember their trip to Paris? Cottin has two levels of funky and unusual household items, some of which you may find delightfully and surprisingly functional, and memorable. Selling original vintage posters and silk prints from America and Europe, this gallery is a great place to get lost in bygone eras. It has resided on Boulevard Saint Germain since 1976. Their stock comprised mostly of travel, cinematic and advertising genres. They are of excellent quality and the shop also does restoration work to the posters so they look as they did when they were new.